Hindu icons are used in prayer. When discussing Hindu symbol icons, it's necessary to define what an icon entails. In this context, an icon refers to an artistic symbol for religious appreciation and worship. These icons are a communicative link between man and God. Devoted Hindus do not profess that God is purely a material statue or a painting. Rather, these sacred images are a means of expressing a relationship with the higher supreme self. Murtis are the images depicted and crafted artistically throughout Hinduism's ancient tradition. A Murti aids in meditation and prayer. Different aspects of the invisible premier God are expressed as Murtis, making them inclusive of the divine spirit. Most of these symbols are as anthropomorphic beings. Some are half-man, half-animal. Others have numerous heads, arms, and blue skin. These outstanding attributes enhance the significance of an icon, representing universal qualities manifested through God. In Hinduism, the most commonly practiced philosophy are the six Vedic schools of thought. Spiritual yoga has an especially important position. Therefore, it is not unusual to see Murtis used in spiritual meditation, while yogis and yoginis strive to attain enlightenment. In the material world, daily natural phenomena are personified in a triad called the Trimurti. Creation, preservation, and destruction are essential for life cycles to endure. Often depicted as a single three-headed man, the Trimurti symbolizes the necessity for these three qualities of the one Supreme Being to unite and ultimately allow universal harmony to exist. Brahma is known as the creator who was born of no mother. There are many stories behind Brahma's birth, but most predominant is that he was born of a lotus flower that blossomed in Vishnu's belly button. Brahma is in charge of passion. 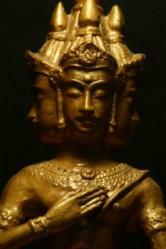 With four heads and four arms, he is a figure of direction and psychology. His arms stand for the North, South, East, and West while his heads are symbolic of mindfulness, confidence, self-awareness, and intellectuality. There are many items that Brahma carries or has near him. Most often, he is with a book of wisdom, a rosary of time, a crown of superiority, and a lotus flower of creation. He is the least worshipped of the three deities in the Trimurti with only a select number of temples dedicated to him. However, many people worship him indirectly by chanting the mantra "Gayatri", which translates to, "May my mind be guided by divine light." As the preserver of all beings, Vishnu is chiefly attributed with supreme goodness. He is considered the essence of all-existing in the universe, past, present, and future. His skin is usually a dark-blue tone and he has four arms. In each hand, he carries a special item: a lotus flower, a mace, a chakra wheel, and a conch. Vishna is believed to possess the power to know everything about all manners of existence. He has unchallengeable sovereignty and inexhaustible strength. He can make the impossible happen without hesitation and overcome any force that stands against him. Considered the Superman of the Trimurti, most often he is worshipped in avatar forms known as Krishna and Rama. Shiva is the Murti that deals with destruction and endings, generally depicted in deep meditation. His destructive roll is necessary to the cycle of life, without it, he could not succeed. 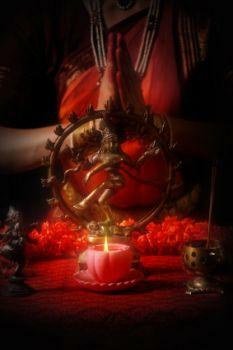 Shiva is balanced by his divine female counterpart, Shakti, who personifies Mother Nature. Shiva is depicted with a moon over his head. Some other Murtis wear a moon on their heads. Ganesh (the elephant-human Murti) being one such deity. The moon indicates divine universal consciousness and mental power. Shiva carries a trident as his weapon of sovereignty in one hand and is sometimes portrayed as having blue-toned skin much like Vishnu. Revealing that he has conquered pride, he is clothed in elephant's skin. Additionally, he denotes his control over lust by wearing tiger's fur. Possibly the most recognized attribute is Shiva's third eye, located between his eyebrows. This is known the center of psychic capacity and higher intuition, and is often referred to as the sixth chakra in many yoga practices today. Hinduism is a vastly diverse religious form containing innumerable sets of beliefs and branches with even more Murtis to represent the varied traditions. However, the base of Hinduism involves differentiating between spirit and matter. Spirit is broken down also, into two parts: the soul of the individual and God. Thus, the foundation of Hindu thought can be named as three truths: matter, God, and self. When studying any Hindu symbol icon, the student can almost always find a representation of each of these three truths, as is the case with the Trimurti.